There are times when low key just won't do. When you're looking to make a statement, create an impact or brighten up any space to maximum effect, bright lights and vivid colour are definitively in order. So when it comes to picking the perfect Christmas tree to add the ultimate Christmas sparkle, you might consider our gorgeous fibre optic trees. 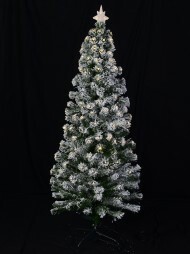 We have a wide selection of these quality trees at excellent prices. 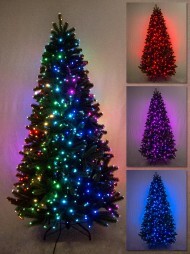 Our wide range of fibre optic trees uses the latest technology. Each branch is implanted with fibre optic strands, which together can create a magical show of an ever-changing light and pattern. 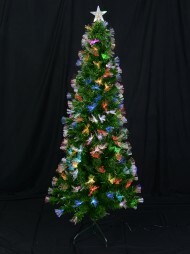 Our fibre optic trees are of solid construction with a sturdy base and thick foliage. They are easy to construct, and with their immediate impact of light and colour, you need not add any other Christmas decorations. For a super easy and quick Christmas centrepiece, look no further. 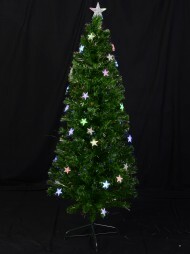 For those who can't go past a tree bestowed with Christmas decorations, some of our styles do feature Christmas baubles and stars as part of their design. 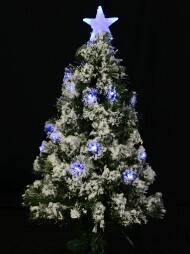 Our fibre optic trees are also available in a good range of sizes so you're bound to find one to light up your home, office or store front this festive season. 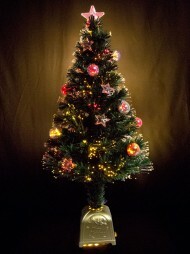 For ease of use, quick impact and festive atmosphere, nothing beats a fibre optic Christmas tree. For our full range, and any additional Christmas decorations or décor you might need for your Christmas party, festive display or family gathering, browse through our selection, either online or in store.